Woody Guthrie was born on July 14th, 1912 in Okemah, Oklahoma. Over the decades, his songs have run around the world like a fast train on a well oiled track. They’ve become the folk song standards of the nation, known and performed in many languages throughout the world. Pretty Boy Floyd, Pastures of Plenty, Hard Travelin’, Deportees, Roll On Columbia, Vigilante Man and This Land Is Your Land are among the hundreds of his songs that have become staples in the canon of American music. The GRAMMY Museum is partnering with the Guthrie Family / Woody Guthrie Publications, Inc. and the Woody Guthrie Archives to create the Centennial celebrations. The year-long celebration will include a host of concerts, programs and events taking place throughout the country and across the pond. It’s a rare thing for an artist to still be making an impact on modern music as he approaches the 100th anniversary of his birth, like Woody Guthrie is. It’s fitting then that people have been celebrating Woody’s centennial, at multiple events across the country, all year long. A big list of remaining events across the country is below. We’ll also highlight a few. The Guthries, who will perform Woody’s songs as well as new material written by various family members, will spend the day after Woody’s birthday at Central Park Summerstage. The free Sunday (7/15), NYC show starts at 7pm. They also play a show in Ocean City, NJ the next day, and Newport Folk Festival later in the month. All tour dates are listed below. Sarah Lee Guthrie & Johnny Irion play Hill Country in NYC on 7/12. 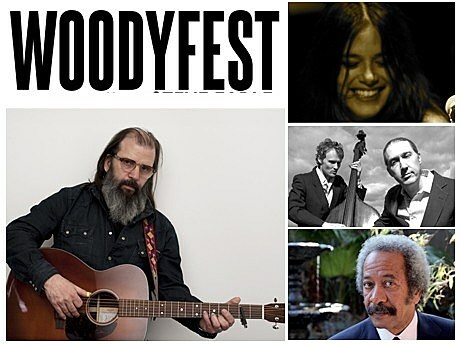 City Winery in NYC will play host to a trio of events titled “Woodyfest” from July 11-13 Hosted by Steve Earle, the shows will feature an assortment of artists paying tribute to the troubador. July 11 features John Hammond & Tim Robbins, and more TBA (tickets). July 12 has Rachael Yamagata, The Wood Brothers & Allen Toussaint (tickets). July 13th features Billy Bragg, Amy Helm & Joe Purdy (tickets). Brooklyn College will host a “Woody at 100″ celebration on September 22 with a conference, and a tribute concert. More events, dates, and some videos from the party that took place at the 2012 Clearwater Festival in June, below…. 100th Birthday Celebration in Woody’s hometown! An exhibition of selected visual works by Woody Guthrie. Curated and designed by Nora Guthrie and Steven Brower, fifty-eight high-quality reproductions of political cartoons, pen and ink illustrations, watercolors, children’s art, and oil paintings represent various stages and developments in Guthrie’s life as a visual artist. With images and text drawn from the eponymous publication, “Woody Guthrie Artworks, The Journals, Drawings, and Sketchbooks of an American Original” (Rizzoli 2005), the exhibit unveils a previously unexplored aspect of this American icon. Educational Cconference and Exhibit on Woody Guthrie sponsored by folkwaysAlive! at the University of Alberta in Edmonton. It will take place in partnership with the Edmonton Folk Festival (August 9-12). Guthrie exhibit in the AGA galleries at the same time, curated by the Woody Guthrie Foundation & Archives. 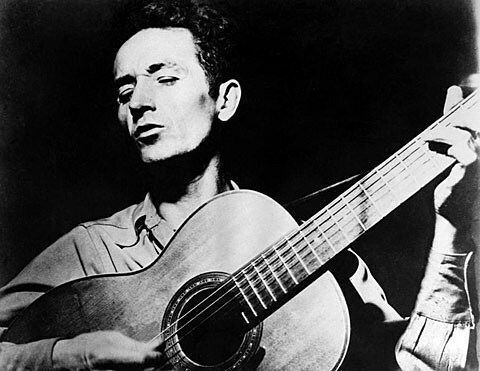 There will be an extensive line-up of speakers including Nora Guthrie, Robert Santelli, Anthony Seeger, Ronald Cohen, Rob Bowman, Michael Kleff, Will Kaufman, Jorge Arevalo Mateus, Kip Lornell, Barry Ollman, and Jerry Gray, with a focus on the international impact and influence of Woody Guthrie. The event is part of the Guthrie centennial being celebrated in 2012 throughout the world, and co-ordinated with Nora Guthrie, Woody Guthrie Publications, Woody Guthrie Foundation & Archives, as well as Robert Santelli and the GRAMMY Museum. The conference will also include films, and concerts, as well as Guthrie events taking place at the Edmonton Folk Festival over that weekend at Gallagher Park. Woody Guthrie is a musical hero of legendary proportion who transformed folk music into a vehicle for social protest and evoked the restless spirit of the Dust Bowl generation. Woody Sez brings the giant to life in a joyous, toe-tapping, and heartfelt theatrical portrait that uses Woody’s words and songs to transport the audience through his fascinating, beautiful, and sometimes tragic life. Featuring many classic Woody tunes including “This Land is Your Land” and “Bound for Glory,” Woody Sez captures the heart and spirit of Woody Guthrie and the stories of America.